We’ve been using milled flaxseed in our porridge for quite a while as it is great for our gut health and general well being. 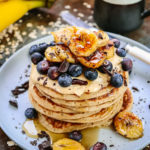 But we hadn’t thought about how versatile it can be – meaning we can gain all the benefits of flaxseed far more easily than we’d thought by including it in our recipes or simply as toppings on salads, smoothies and breakfast bowls. 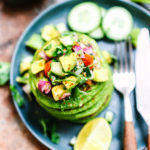 When we were approached by Yum & Yay to create recipes that follow the Yum & Yay way of saying “yes to healthy” we enjoyed coming up with easy and healthy recipes that make your taste buds tingle. and the most wonderful vanilla and chocolate vegan and gluten free cheesecake! 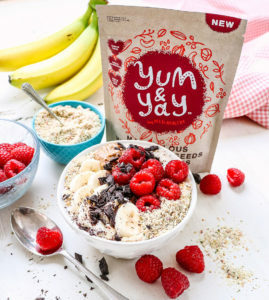 Boost your porridge bowls daily benefits by including Yum & Yay Marvellous Milled Mixed Seeds and Raspberries to create a delicious breakfast. 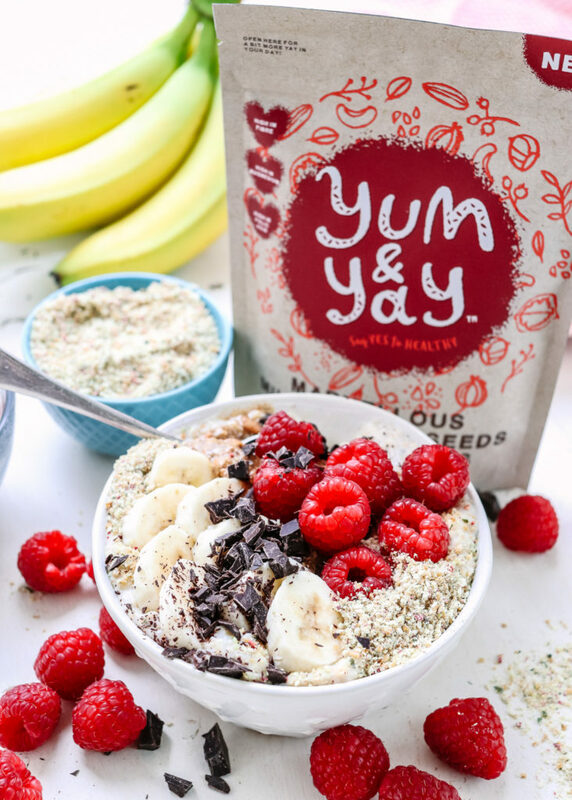 Add the oats and two tablespoons of Yum & Yay Marvellous Milled Mixed Seeds & Raspberries to a saucepan; pour over the oat drink and stir. 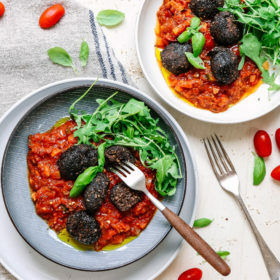 Gently cook over a low to medium heat for 8-10 minutes, stirring occasionally until cooked. Pour in more liquid until the porridge has reached your desired consistency. 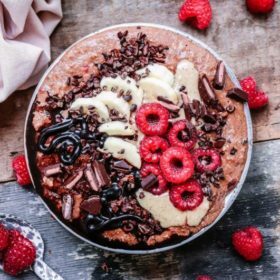 Spoon the porridge into a bowl and sprinkle with Yum & Yay Marvellous Milled Mixed Seeds & Raspberries, fresh raspberries, chopped banana, a spoonful of peanut butter and some chopped dark chocolate. 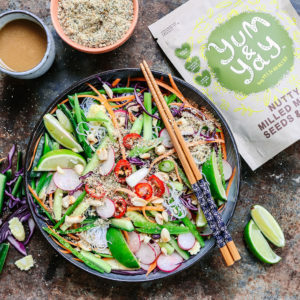 Add Yum & Yay Nutty Milled Mixed Seeds & Nuts to your meals as we have with this vibrant noodle salad bowl for added fibre, omega 3 and vitamin E.
Prepare the rice noodles according to the packet instructions, rinse in cold water and set to one-side. Slice and prepare all the vegetables. Toast the peanuts in a dry frying pan over a medium heat until they start to colour. Remove from the heat. To make the dressing add all the ingredients to a small bowl and stir to combine. 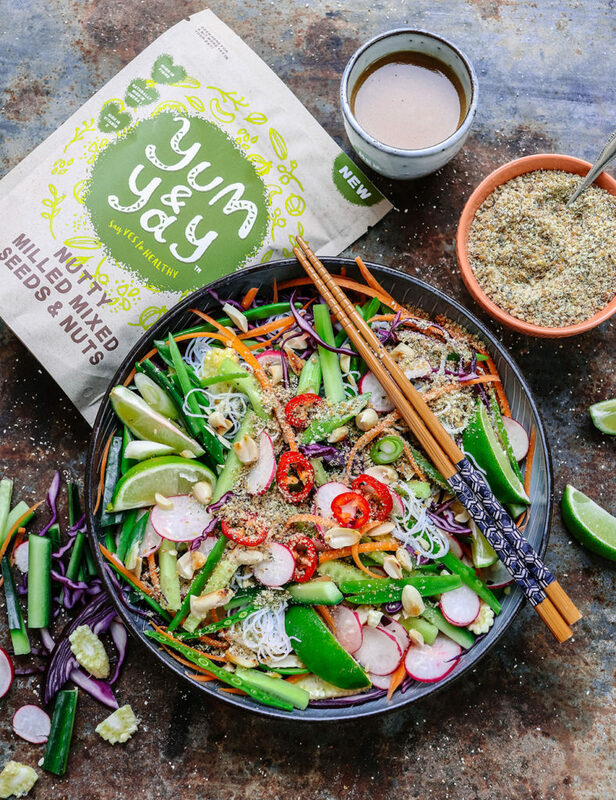 To serve the salad divide the noodles and vegetables between 2 bowls, add a tablespoon of Yum & Yay Nutty Milled Mixed Seeds & Nuts and mix together. Drizzle over the dressing; add a sprinkle of the Yum & Yay Nutty Milled Mixed Seeds & Nuts and the toasted peanuts. Enjoy. 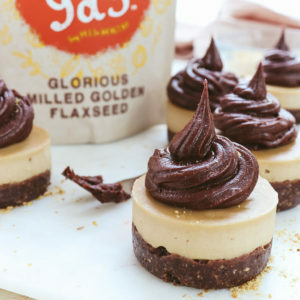 Use Yum and Yay Glorious Milled Golden Flaxseed to create a nutty chocolate base for this deliciously creamy vegan cheesecake. 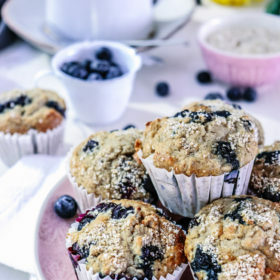 Flaxseed is full of fibre, zinc and protein. 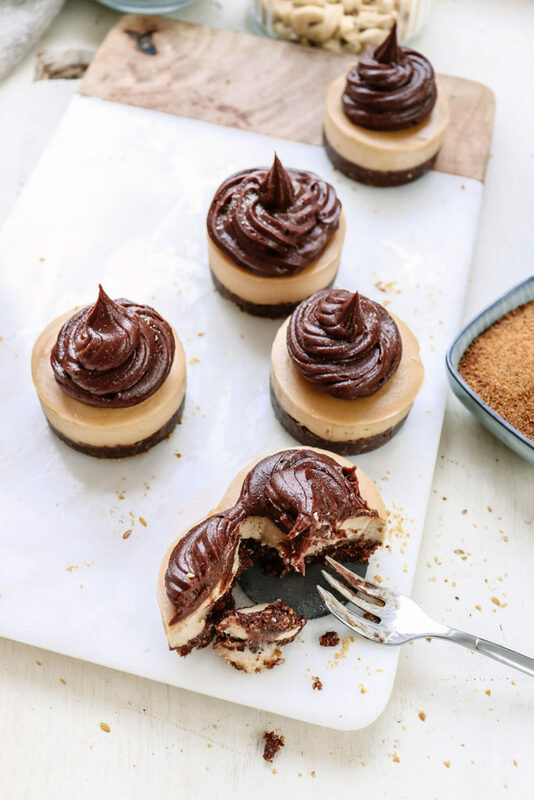 Makes 9 mini vegan cheesecakes or one cheesecake. Use a 12-holed (6cm each) loose-bottomed tin or a small round (15cm) loose-bottomed tin. Weigh out the cashew nuts into a jar or bowl and pour over cold water to about 3cm over the top of the nuts. Seal the top or cover and leave to soak overnight or for a minimum of 4 hours. The longer you leave the cashew nuts to soak that creamier the mix will be. Use a little coconut oil to grease the inside and base of the tins. Put the pitted dates into the food processor and blend until they form a paste. Then add the remaining base ingredients and blend again for a few minutes until the mix is combined and binds when you press the mix together in your hands. Spoon the base mix evenly between the tins and use your fingers or the back of a spoon to firmly press down the mixture until you have a smooth even layer. Place into the fridge while you make the vanilla layer. Gently melt the coconut oil in a saucepan over a low heat and add the coconut sugar – stir until it dissolves. Take off the heat and set to one-side. Drain and rinse the cashew nuts and add them to a high-powered blender or food processor. Add the coconut cream, melted coconut oil, coconut sugar and vanilla extract to the blender with the cashew nuts. Blend for 5 minutes until the mixture is creamy and smooth. Remove the bases from the fridge and spoon over the vanilla layer, smooth the surface. 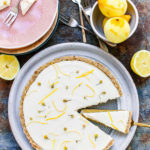 Return the vegan cheesecake to the fridge and allow them to set for a few hours. There will be a small amount of topping left – retain to make the chocolate swirl. Once the cheesecakes have set, make the topping. In the blender add the remaining cheesecake filling with 4 tbsp. cashew butter, 2 tbsp. raw cacao powder and 2 tbsp. coconut milk. Blend until smooth. To serve, carefully remove the cheesecakes from the tins. Place the chocolate cashew topping into a piping bag fitted with your nozzle of choice. Pipe the filling onto the top of the cheesecakes. Keep the vanilla and chocolate cheesecakes in the fridge and eat within 4-5 days. 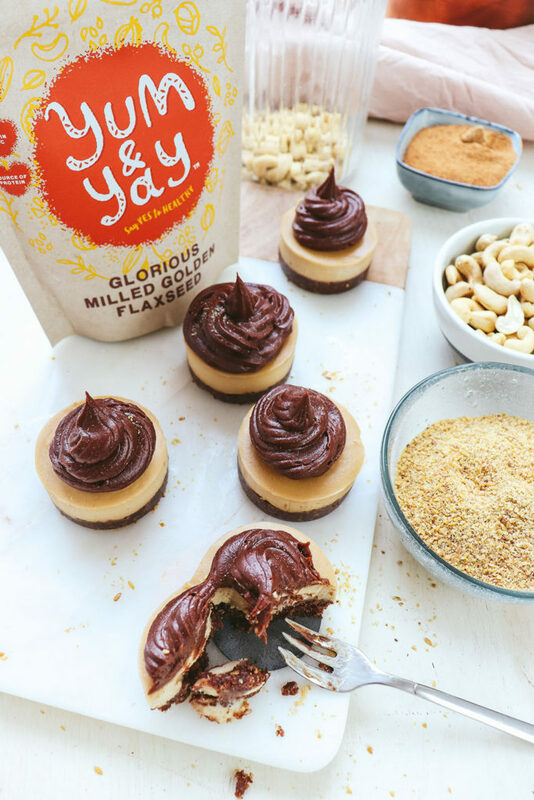 We know you may be thinking this is just a paid advert – but we can wholeheartedly recommend Yum & Yay and we will continue to add their milled flaxseed mixes to our meals.